The Gorgon were an eclectic 3 piece Winnipeg combo, kind of a punky mix of garage, alternative and theatrical art rock. This was the poster for their Corpse Whale CD release party back in 2007. Their only other release was a cover of a Personality Crisis song on a compilation put out by local college radio station CKUW. They broke up a year or so ago. 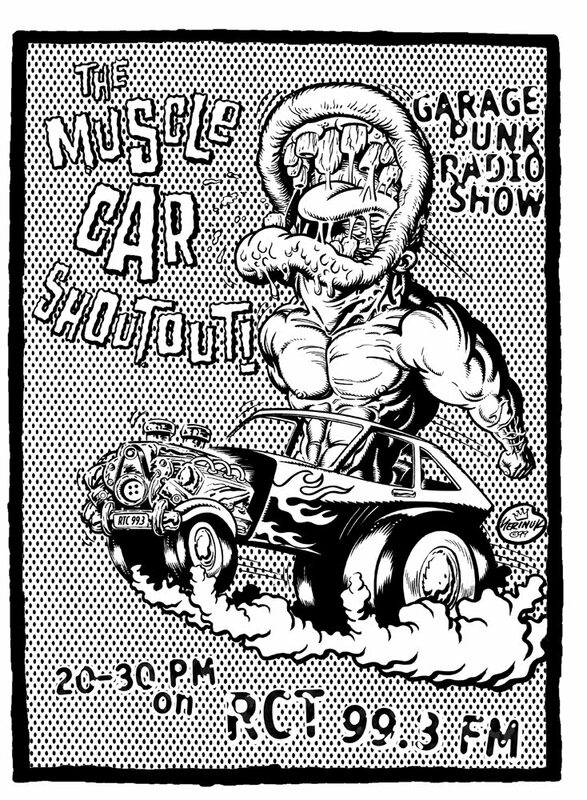 This poster was the first in a 3 poster series I did for Gorgon shows, all involving giant women wreaking havoc. 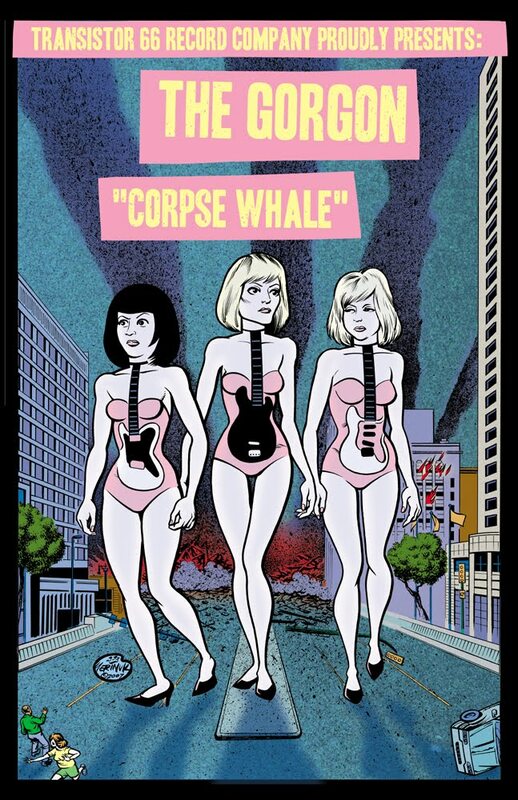 The second entry in the Women Of Mass Destruction series was the American Flamewhip CD release poster which you will find in the archives of this blog. I'll post the final one tomorrow. Stay tuned for MORE ACTION! 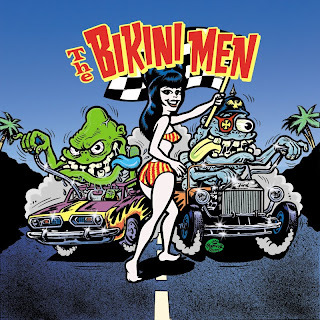 Here's the front art for the Bikini Men picture disc LP that came out back in 2005. 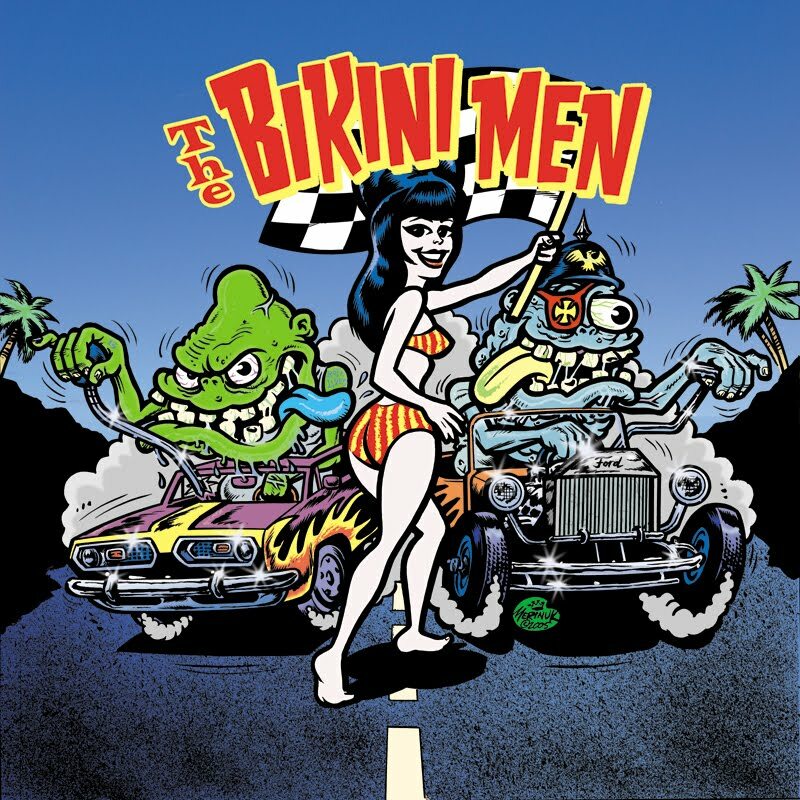 This was the third and to date last pic disc design I've done, and it was released on Bikini Beach Records, a spinoff from well known French rock'n'roll label Banana Juice. Scroll down a bit to see my other artwork for the Bikini Men and you can read a bit more about this fine French surfin' combo in that post as well. Stay tuned for MORE ACTION! 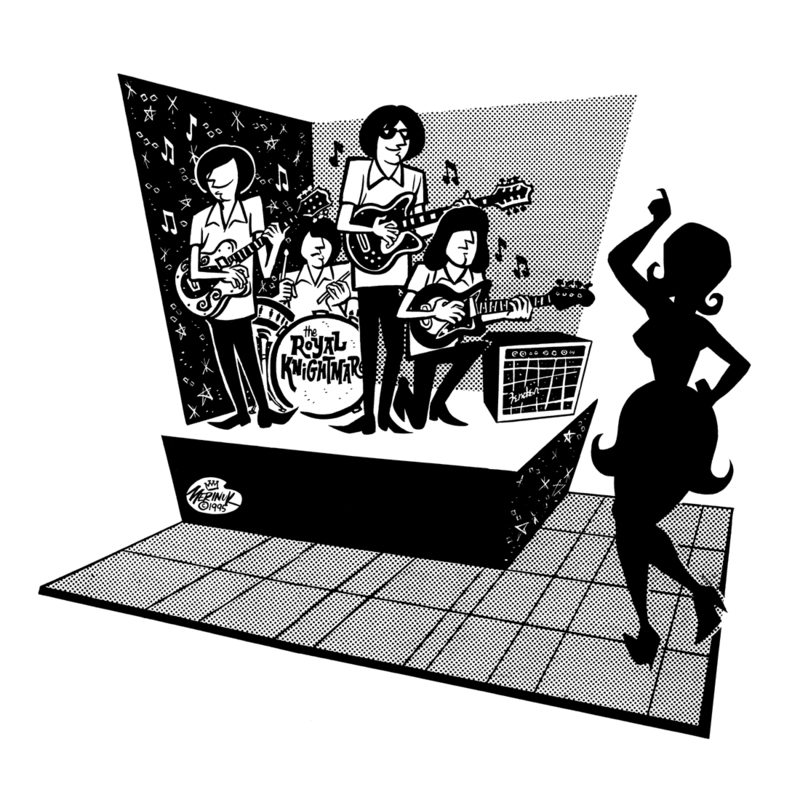 I made this sleeve back in 1998 for trashy Italian garage combo The Tripmakers. For Monsters Records outta Cagliari, Italy put out the 7". At the time I was using a combination of ink, watercolor and acrylic for color pieces like this, a fun technique that I'd like to revisit sometime. Stay tuned for MORE ACTION! 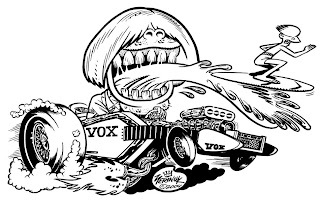 This CARtoon version of of the George Barris-designed kustom Voxmobile was drawn back in the mid-'90s for the Anti catalog, a short-lived mailorder sideline of then-burgeoning Epitaph Records devoted to selling garage and punk records plus T-shirts, fanzines and other merch. 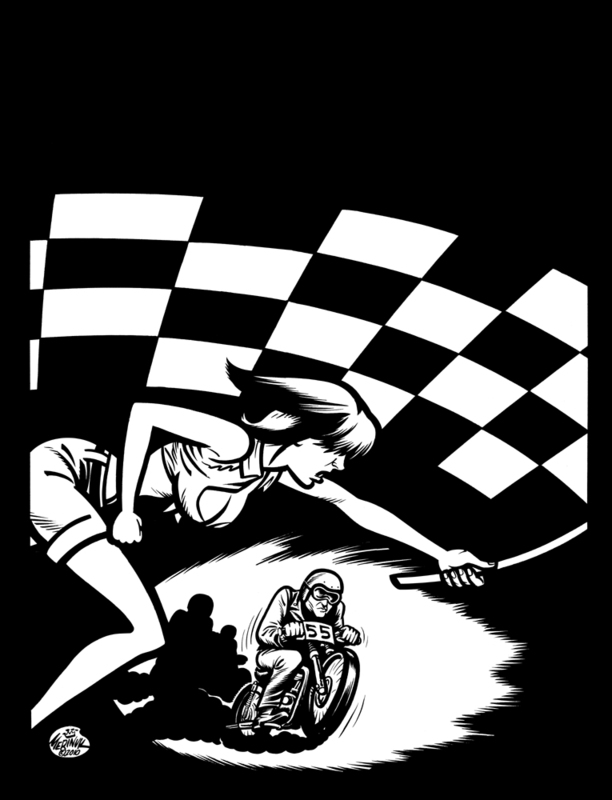 The issue of the catalog that this drawing appeared in was included as an insert in an issue of Spin, making it probably the single most widely distributed piece I have ever drawn, and the one and only time my work was available for purchase at my local Safeway. 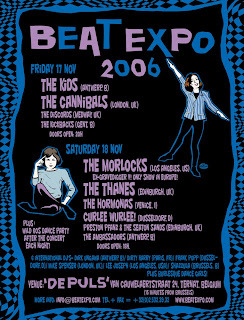 About 10 years later I revised and upgraded the image for my friend Willem from Swamp Room Records, who used it as the poster for one of his psychedelic rock'n'roll festivals. I guess I will be due to recycle it again in another 4 years or so. Stay tuned for MORE ACTION! Here's one so obscure I had almost forgotten about it myself. 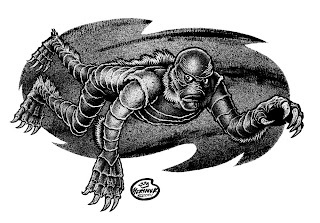 Back in the mid-'90s the guy who ran Worrybird Records outta Georgia decided to put out a monster movie magazine in the Famous Monsters Of Filmland tradition. As a lifelong horror freak I was thrilled when he asked me to illustrate a planned article on '50s schlock auteur Bert I. Gordon, the man behind such drive-in classics as The Amazing Colossal Man and Earth Versus the Spider. The drawing I came up with is mostly a tribute to The Cyclops which features Lon Chaney, Jr as a drunken pilot and Dean Parkin as a giant skull faced mutant on a rampage. I threw in a little nod to Gordon's Attack Of the Puppet People as well. I guess the tiny man was meant to be a portrait of Puppet People star and B-movie great John Agar but for some reason it came out looking more like Russ "War Of The Gargantuas" Tamblyn. Anyhow I sent the artwork off to Georgia but the mag never came out and the whole thing was more or less forgotten about until I came across some photocopies of the art a few days back. So, a mere 16 years after the fact, here is the grand debut of my artistic tribute to Hollywood's Mr. B.I.G. Stay tuned for MORE BULLETS CAN'T STOP IT! NOTHING CAN KILL IT! ACTION! 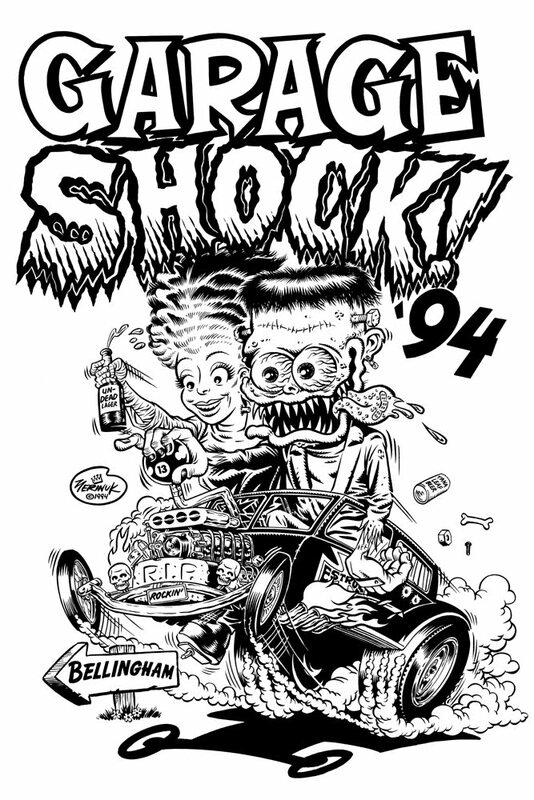 I drew this one for fun way back in 1992. 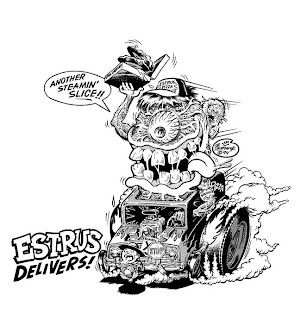 Not long afterwards the drawing (sans text) was used on the back of the Marble Orchard 7" sleeve I did for Estrus Records. Stay tuned for MORE ACTION! Found this in a folder of art from the '90s. I don't remember drawing it and have no idea what it may have been for. Your guess is as good as mine on this one. Stay tuned for MORE ENIGMATIC ACTION! 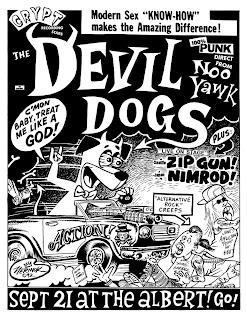 I kinda started at the top in this here rock'n'roll show poster racket 'cuz two of my earliest efforts in the genre were for shows by the mighty Devil Dogs! 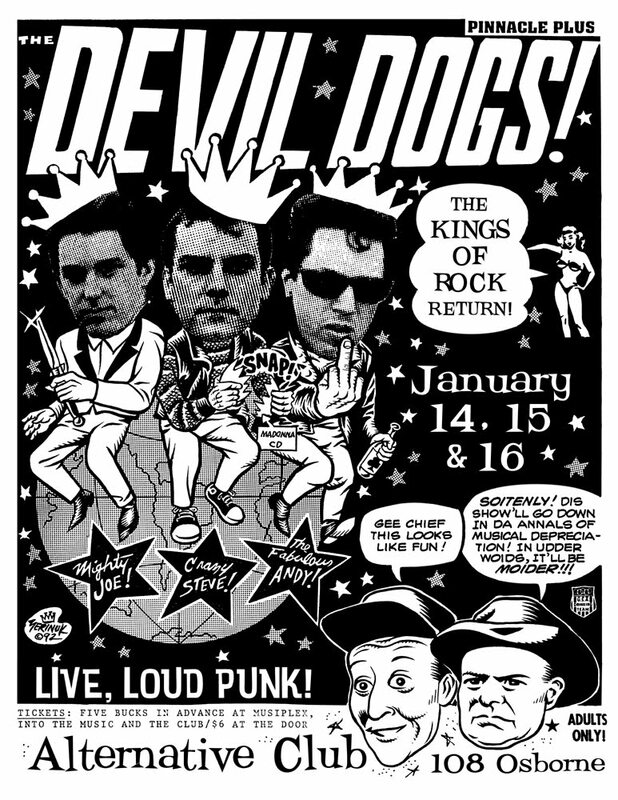 Hard to believe these guys played in my crummy hometown no less than 3 separate times back in the early '90s, including a memorable 3 night stand at the Alternative Cabaret right in my very own neighborhood. At the top is the poster for their first show at the Albert back in 1992 and the other poster is for their January '93 shows at the AC. I don't consider these to be classics of the rock poster art form or anything but I'm posting them because I'm damn proud to have had the chance to do some work for one of the greatest rock'n'roll bands of all time. 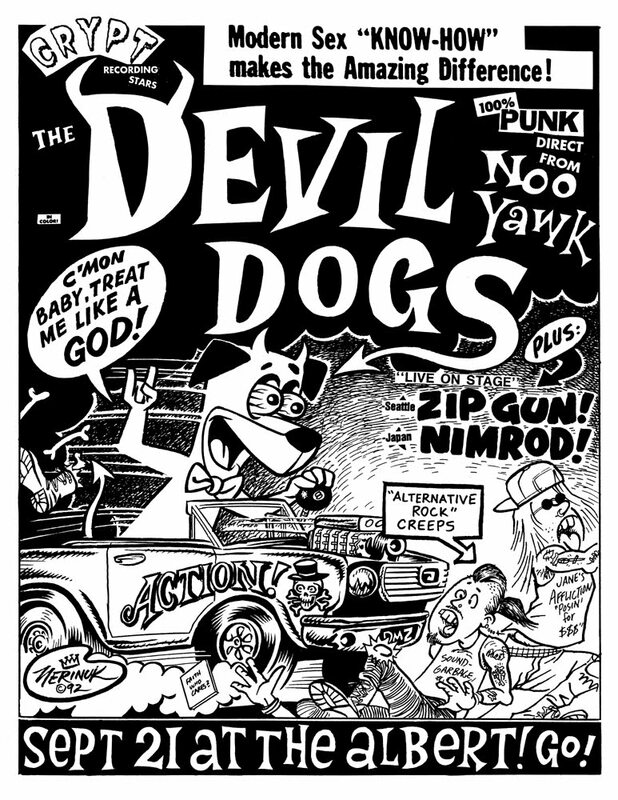 Not sure which yet but one of these has just been printed in We Never Learn: The Gunk Punk Undergut, 1988-2001, the new book by New Bomb Turks chanteur Eric Davidson chronicling the garage punk onslaught of the 1990s. Yeah, all that goofy fun we had 20 years ago is now deemed to be of sufficient cultural worth to deserve to have whole big books written about it. This is what I get for not dying young when I had the chance. Oh well. Stay tuned for MORE IT'S NOT THAT I DON'T LIKE PEOPLE, I FEEL BETTER WHEN THEY'RE NOT AROUND ACTION! Here's some more mad monster mania to fuel your Royal Knightmares. Drawn back in 1995, this 'un was meant to be a 7" sleeve for Italy's mysterious '60s-style garage combo The Others. 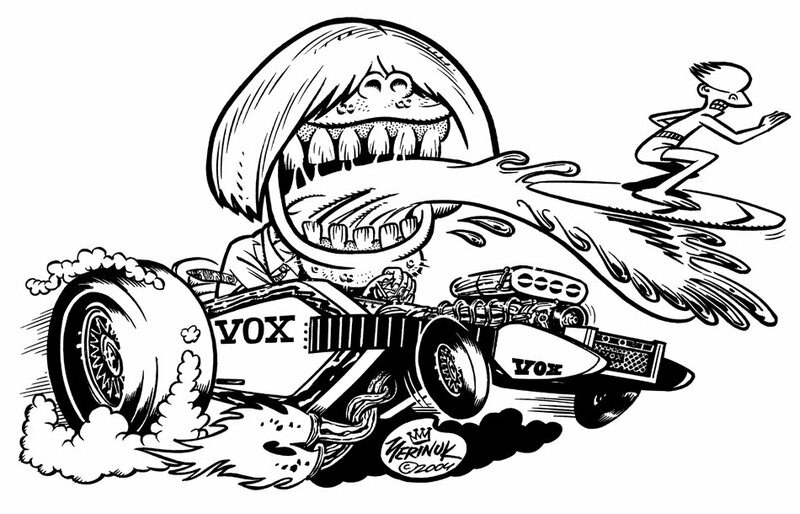 For whatever reason it was never used as such though the Vox Phantom-playin' vampire vixen was clipped out and used on various ads and flyers for the band and their label, Misty Lane Records. Herewith the complete drawing is unveiled to ye of the eager public for the first time ever, so dig. Stay tuned for MORE ACTION! 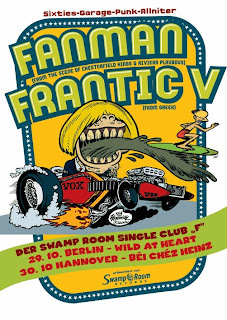 Here's a poster I put together a few years back for one of the many rock'n'roll weekenders that proliferate all over Europe. This was sorta art directed by the guy who was putting on the festival so I didn't do much actual drawing here, just cartoon renderings of a couple of photos of '60s fashion models that he sent me. Some very cool combos on the bill, wish I coulda made it to the show. Oh well. Stay tuned for MORE ACTION! 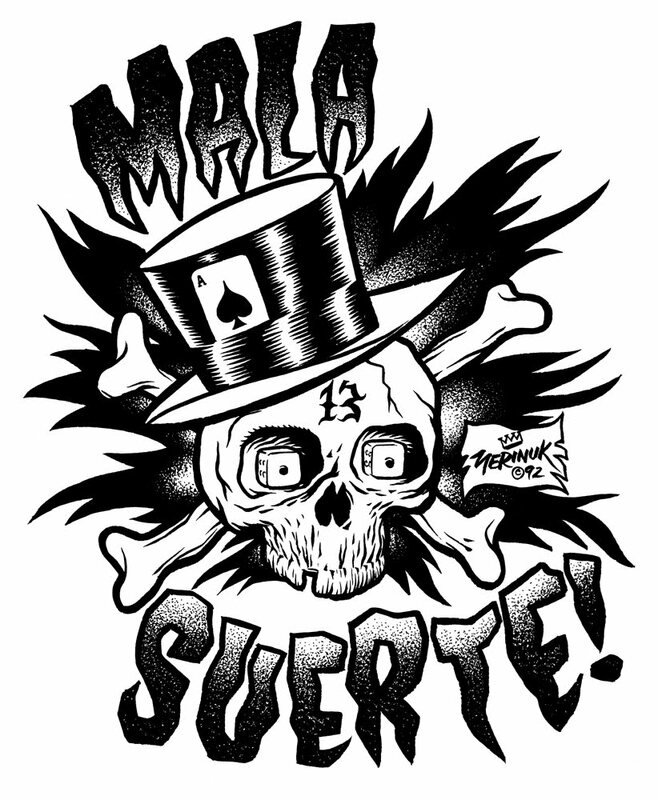 I drew this one way back in 2001 as a tattoo design for Gualtiero from Rockin' Bones Records over in Italy. The Creature has always been one of my fave filmland fiends so I was glad to have a chance to do a drawing of him. Stay tuned for MORE UNIVERSAL-INTERNATIONAL ACTION! 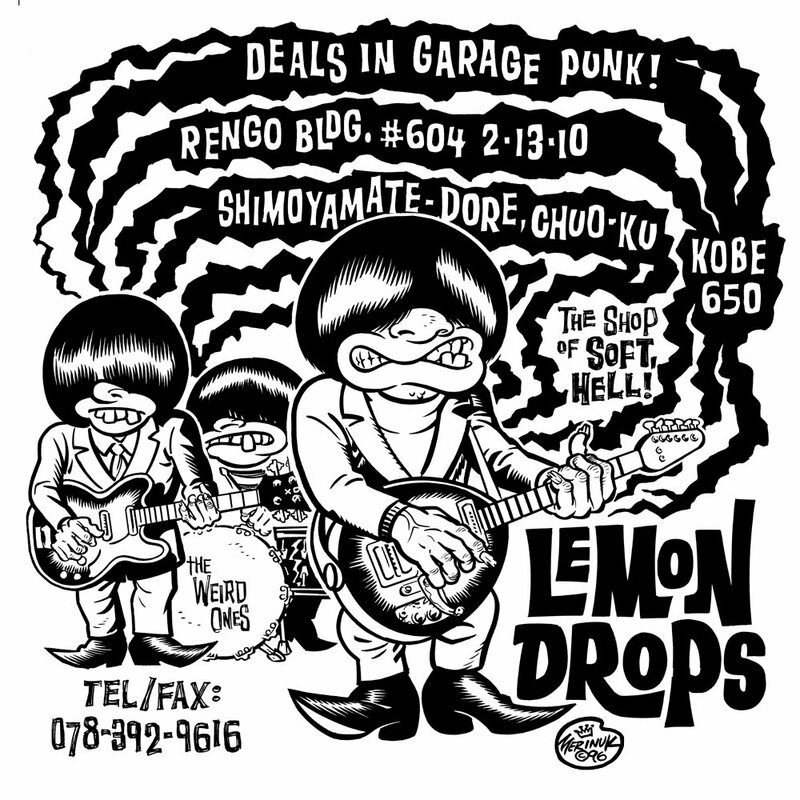 I drew this one back in the mid-'90s for a cool garage and trash culture oriented record store in Kobe, Japan which was run by King Joe from the crazed, noisy Magnitude 3 combo. There's some cool footage of the store on one of those Soft, Hell! video comps that came out back around then. 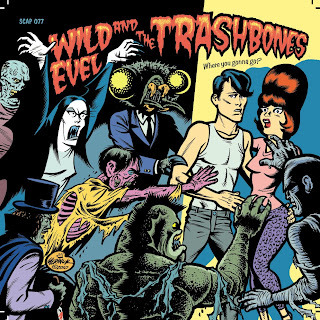 If I remember rightly they were gonna use this artwork on LP sized plastic bags for the store. I haven't gotten to do much art for Japan because they have so many amazing artists of their own there, but it's always a kick when I get to do so. Stay tuned for MORE ACTION! Sleeve art for a forthcoming 7" on Germany's always amazin' Screaming Apple Records. Both combos are from Austria (they share a member or two) and play trashy snot-infused '60s garage a la early Gruesomes or The Gravedigger V. Thanks Ritchie. Stay tuned for MORE ACTION! Here's another teaser from the forthcoming Flying Saucers Rock'n'Roll book, compiling the wildest r'n'r interviews from the frantic pages of Roctober magazine. Still waitin' for word on the release date of this mighty tome but it should be happenin' pretty soon. Stay tuned for MORE ACTION! 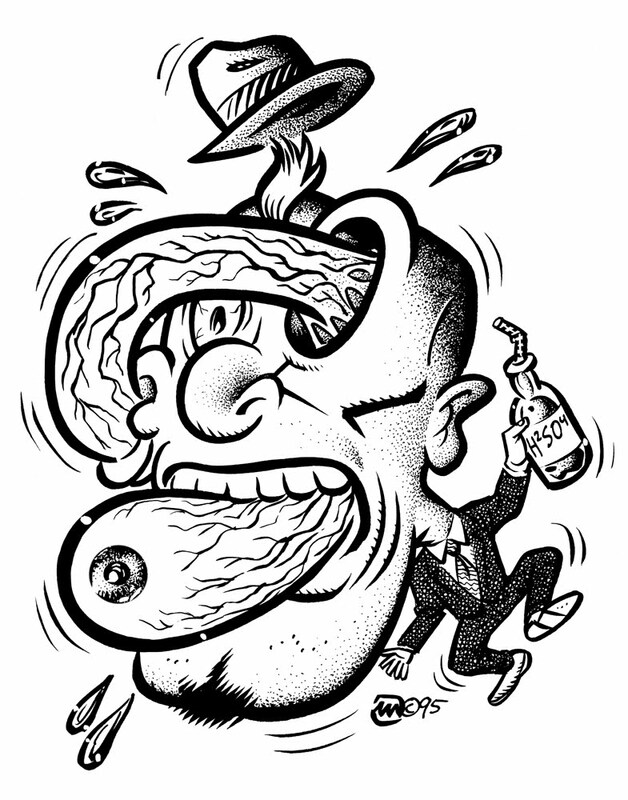 Here's a wacky little drawing that I did a few years back. 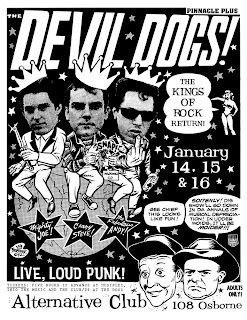 It was originally part of a series of sticker/T-shirt ideas that I was trying to market but later I sent it to my pal Larry from Amp Records when he needed a quickie poster for his band Spoiled Rotten. There's no real point to this, I just think that incontinence is funny. Stay tuned for MORE ACTION! 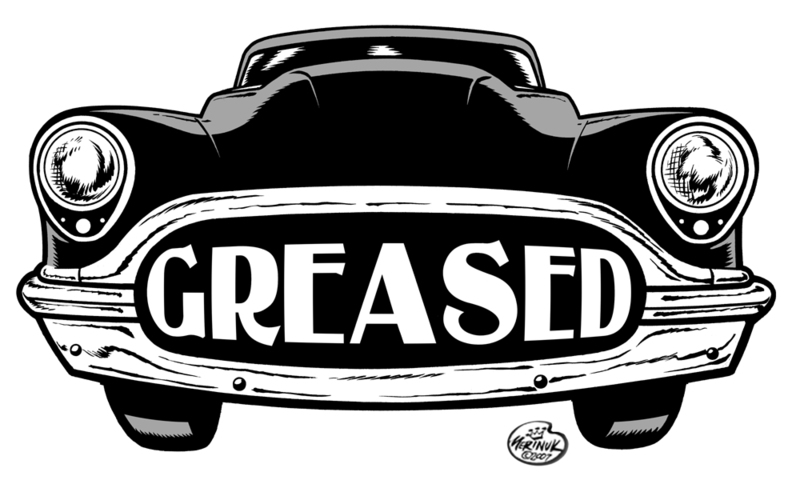 Here's a promotional logo I did a few years back for a locally produced documentary about a group of friends kustomizing a '53 Buick and taking it on a road trip to an auto show. This was gonna be used as part of a presentation to help the director find investors to complete the movie but I guess nobody stepped up with the cash. 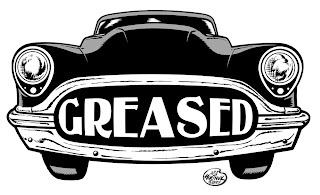 Too bad because it looked like a fun little movie with a soundtrack featuring local rockabillies The Farrell Bros. The plan was for me to do the poster art for the release which also would have been a lotta fun. Oh well. I think they also made baseball caps featuring the above art for the cast and crew of the movie but I never got one of those. Stay tuned for MORE ACTION! 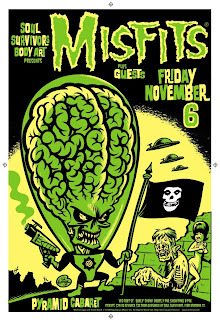 As a frantic fan of The Misfits since way back in the '80s it was one of the biggest thrills of my career to land the poster design chores for their November 2009 show here in Winnipeg. The concept and artwork came together really quickly and I was quite happy with how the whole thing turned out. The idea of printing a color silkscreen version of the poster was being kicked around so I took it upon myself to contact the band via their website and ask their permission to pursue that project. 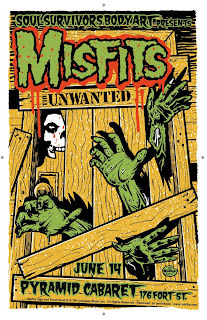 To my surprise and amazement they not only gave permission to make the posters, but also offered to buy the rights to my drawing for use as part of the official Misfits T-shirt line! Talk about a dream come true. Flash forward to a couple days ago when the T-shirts and posters went on sale at the official Misfits Fiend Store and I got the go ahead to post the image here in the Rubber Room. Funnily enough the band are back in Winnipeg tonight for another show at the same venue. 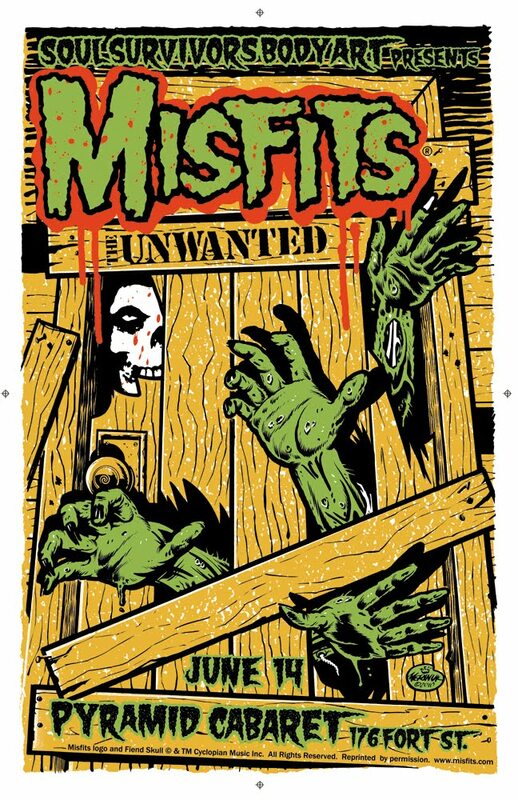 Check out www.misfits.com if you're interested in getting a shirt or poster (there are only 138 signed and numbered copies of the poster and it is now available exclusively through the Fiend Store). 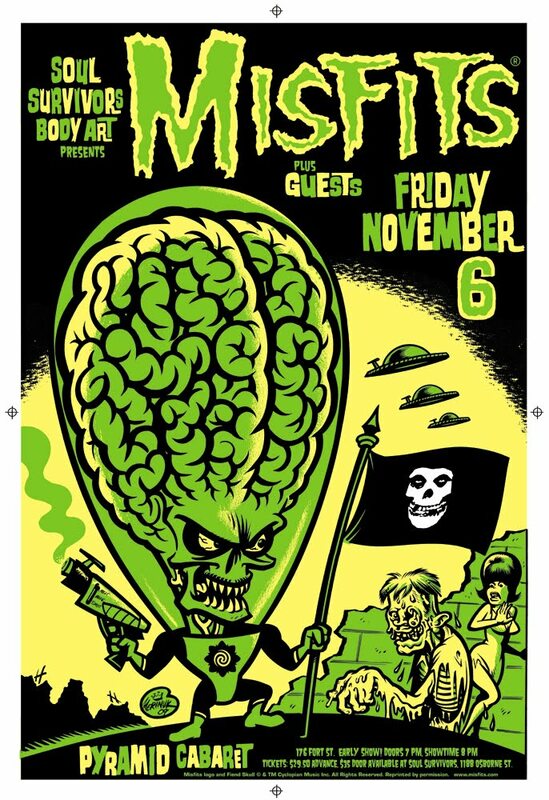 Thanks to John at Misfits HQ for making all of this happen and giving me permission to post the image here, and to Eric and the Soul Survivors crew for throwing the poster design gig my way in the first place. Stay tuned for MORE EVILIVE ACTION! 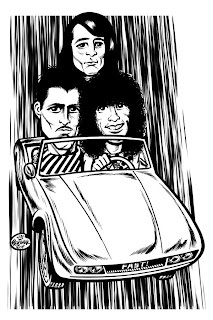 Here's a quickie spot illo I did for the Mortal Coils comic book back in 2002. I have next to no interest in the Sword and Sorcery genre so this was a very rare venture into that kinda subject matter for me. Stay tuned for MORE ACTION! 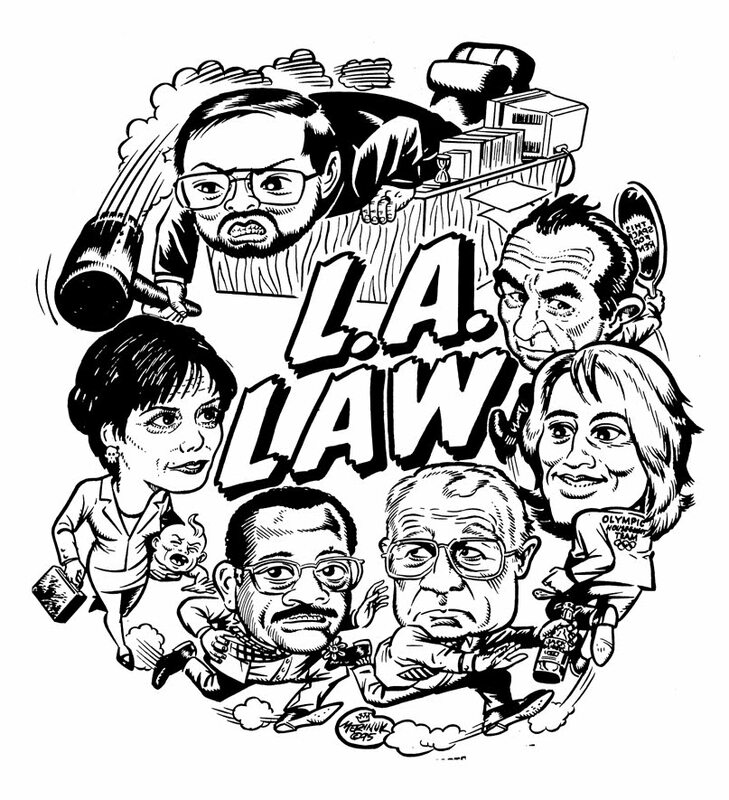 Here's another wacky commercial art job I did back in the mid-'90s when the OJ Simpson trial was dragging endlessly on. 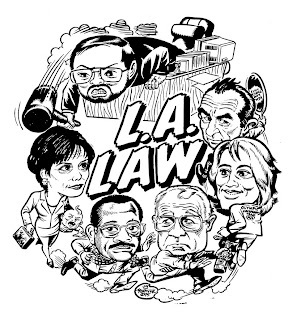 This was a T-shirt intended to satirize and cash in on the ridiculous circus-like atmosphere that pervaded that infamous judicial proceeding. I handed in the artwork shortly before leaving town for a few days and in my absence the piece was retouched by two other artists. Unfortunately I didn't have a chance to photocopy the art before turning it in so there's no record of what my original version looked like. Stay tuned for MORE ACTION! Here's the poster I did for next week's Misfits show in Winnipeg. We printed up a small run of 4 color silkscreen posters of this baby. Here's a link to a short video showing the posters being printed http://www.youtube.com/watch?v=qUl9RCIrQa8. Stay tuned for MORE ACTION! 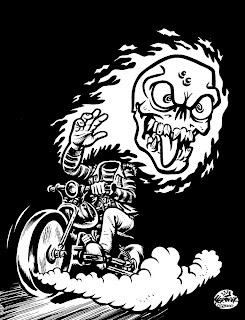 If memory serves, this is the first thing I ever drew for the kool and krazy Kanadian sickle zine Motorcycho way back in the year 2000. 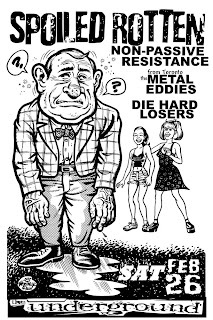 Aside from appearing in the mag there were some neat buttons made that featured this art; maybe some other merch as well that I am not recalling at this moment. Anyhow it was the start of an ongoing series of cycho sickle art that continues to this day. Stay tuned for MORE ACTION! 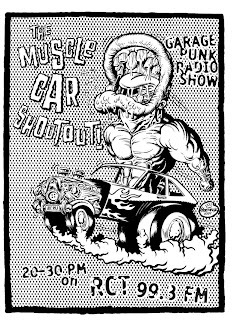 Here's a pretty weird image I came up with back in 1999 for a French garage punk radio show. 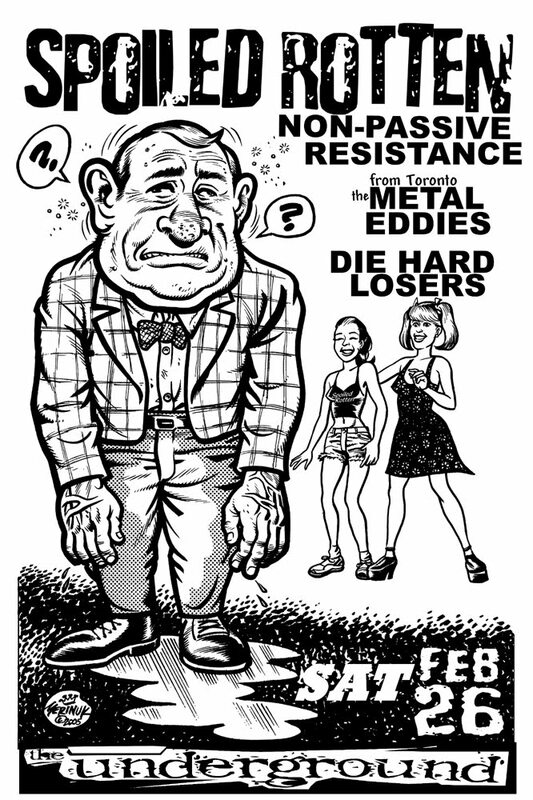 The guy who did the show also published a cool zine called The Arse'Plot back in those days. I had a message from him on MySpace awhile back so he is still on the scene. Stay tuned for MORE ACTION! Here's a piece that I started way back in 1997. 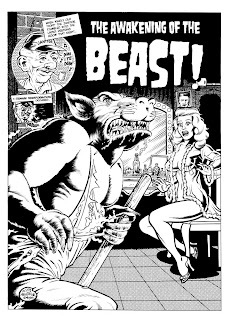 It was meant to be the cover for a Spanish r'n'r zine called El Beasto which was the forerunner of the record label and tour booking outfit currently operating under the same name. Although fully penciled and mostly inked the drawing didn't get finished at that time for reasons that I don't recall at this point. In 2005 I finally finished the inking, cleaned it up and added the text. A couple of years ago I submitted it to a zine that hasn't come out yet so at this point it is unpublished. Stay tuned for MORE ACTION! The Mants are a trashy garage punk combo made up of hideously mutated half man/half insect freaks. There's a lot of that kinda thing going on over in their hometown of Calgary from what I am told. Their insidious plans for world conquest were derailed more than 10 years ago when they were trapped in one of their many underground sugar mines by a sudden cave-in. Recently they have munched their way to the surface once more to resume their war on an unsuspecting human world. 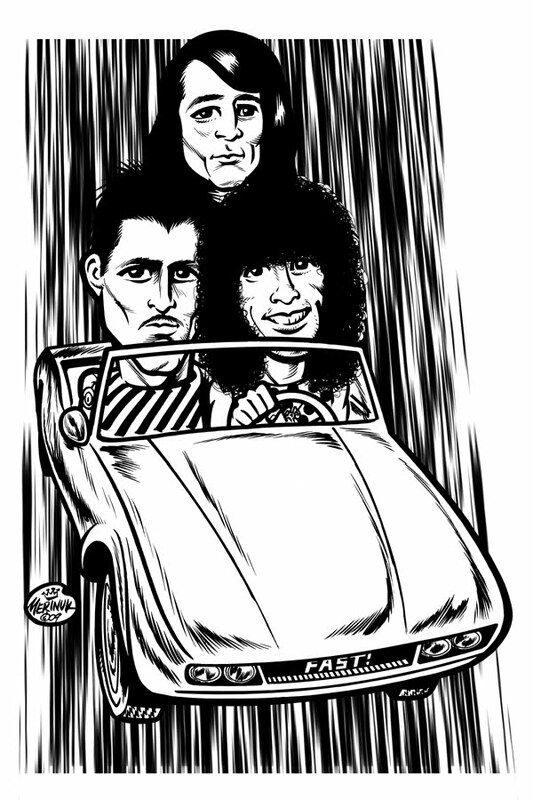 As we all know, a line of suave merchandise is an essential part of any such campaign of carnage, so I was called upon to revise and update my "classic" Mants T-shirt art (originally drawn way back in 1998) into the chopped'n'channeled nitro-burnin' post-Millennial version you see above. 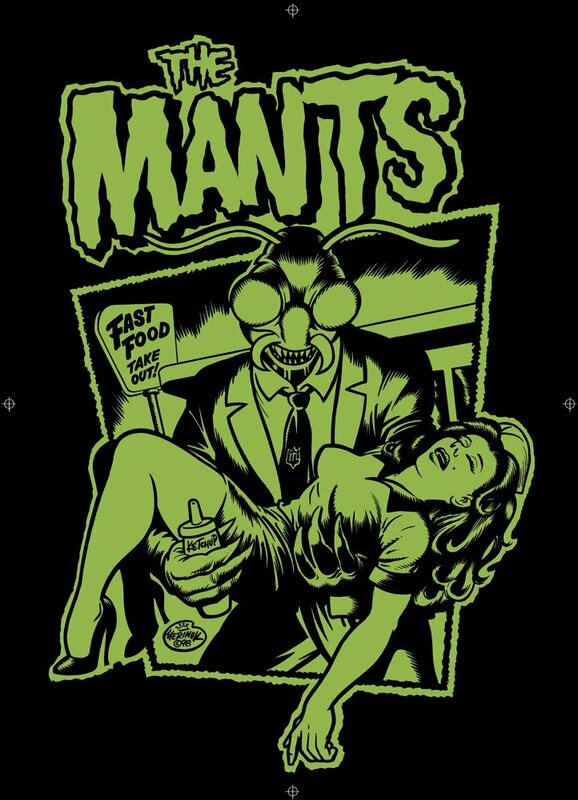 Look up the Mants over on Myspace to see about getting a shirt. Ownership of this garment will shortly be compulsory for all puny humans, so why not beat the rush? Stay tuned for MORE I FOR ONE WELCOME OUR NEW INSECT OVERLORDS ACTION! 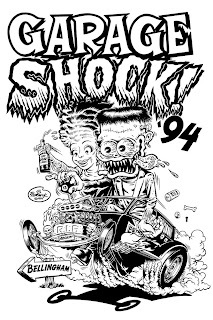 Garage Shock was the annual 4 day festival of trashy rock'n'roll put on by Estrus Records back in their '90s heyday. 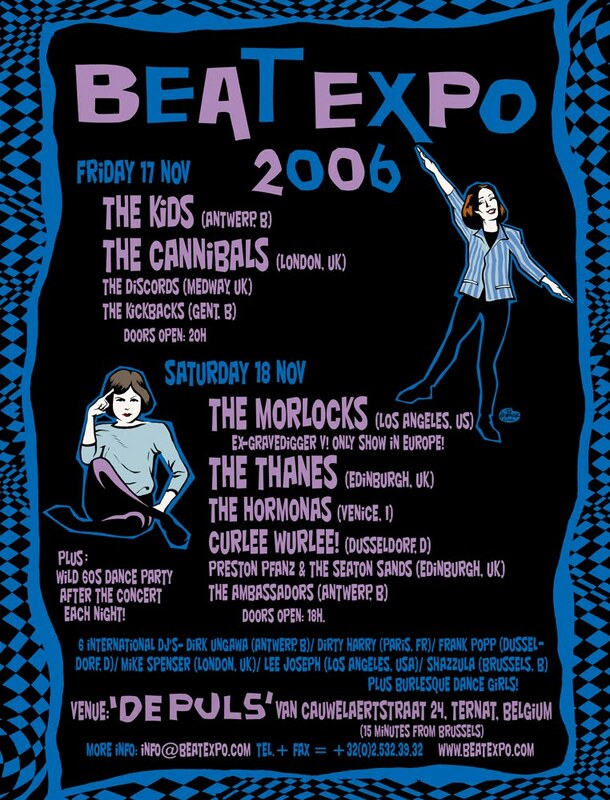 For a few years I had a regular gig designing the T-shirt for this event. This was the third one from 1994. Stay tuned for MORE ACTION! Here's a matched set of drawings that I did for my friend Gerhard to promote his Pure Vinyl Records label. I think he was gonna do T-shirts of these but I never saw any printed shirts so I dunno. 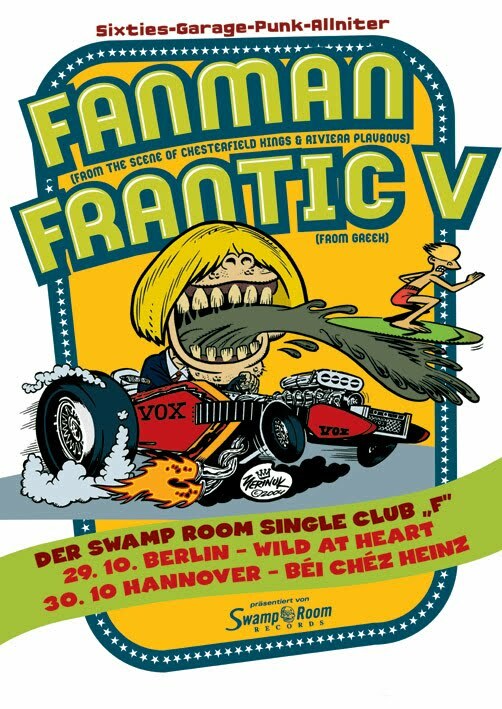 Outta Austria, Pure Vinyl specialized in limited edition 7"s by bands playing garage, punk, surf and related genres. I did a couple of 7" sleeves for them which will show up here in due course. Stay tuned for MORE ACTION! The Royal Knightmares were a moody surf instro combo from Rome, Italy. 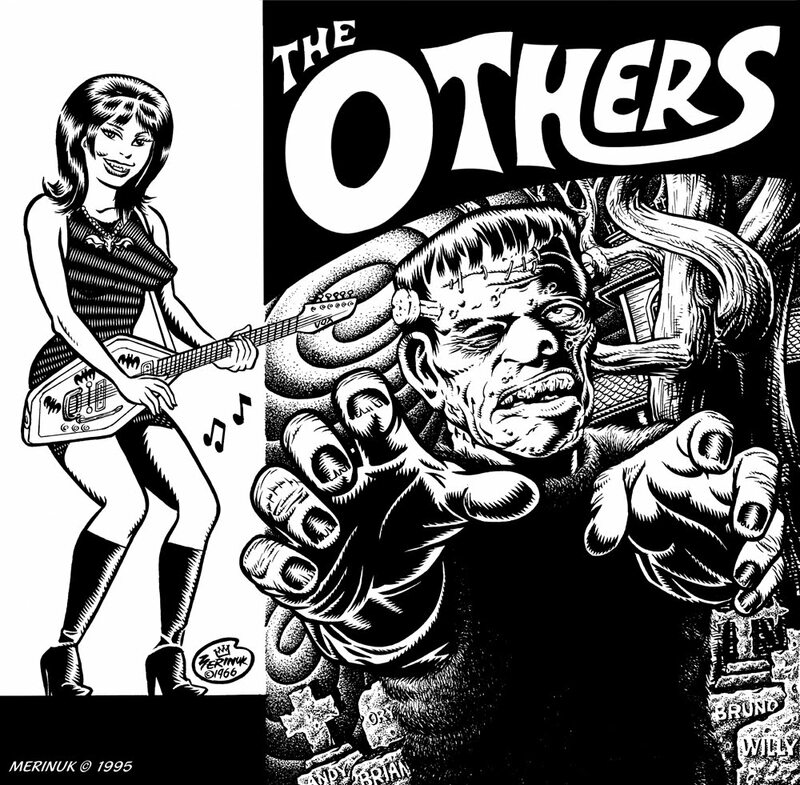 A spinoff from cryptic garage rockers The Others, they took the "Knightmares" part of their name from a story in my Rockin' Bones comic. 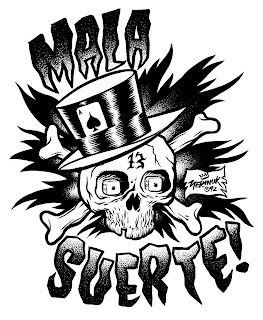 This art was used as the front cover for a 5-song 7" EP that was issued by hip Brooklyn-based label Solamente Records back in 1996. The original art for this is long gone and since the sleeve of the record is crudely printed in the Rip Off Records tradition (I think they may have actually reproduced it from a photocopy I sent them), I scanned the image for you today from a decent quality photocopy of the original drawing that I found in my files. Stay tuned for MORE ACTION! This one was part of another project that never came to fruition. Stay tuned for MORE ACTION! 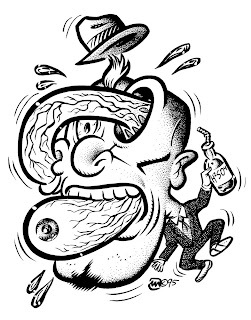 Drew this 'un way back in 1994 for Dave at Estrus Records. Dave liked to have a classy kustom-made touch to everything related to his label so over the years he had various artists design a series of illustrations to be printed on the envelopes he mailed out 7" records in, and this was my contribution to that project. I was aiming for a straight-up '60s Roth Studio look to this piece; didn't quite hit the mark but it's not a bad example of Ugly Art, heavy on the Ugh! Stay tuned for MORE ACTION! 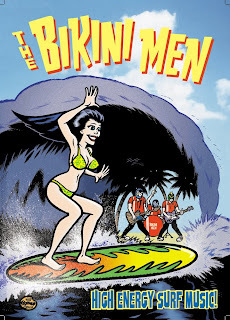 I made this poster art back in 2002 for French surf instro maniacs The Bikini Men. Back in the '90s I had done an LP sleeve for their guitar player's previous garage rockin' combo The Sidewalk Stroll. 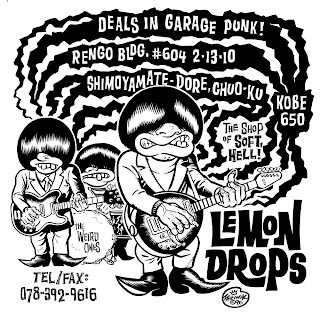 I dunno if they ever actually printed copies of this in its intended poster form but part of it was used as the cover art for their first CD, issued on Banana Juice Records in 2003. Stay tuned for MORE ACTION!